Just handed in a first draft of The Age of Ra to Solaris, and I’m pretty pleased with the way the book’s worked out. As always there’s that sneaking suspicion that there are a million things I could have done better, but I know in my heart of hearts that that’s just Captain Paranoia speaking. Objectively, the novel is a good one that does exactly what I hoped it would do, namely tell a fast-paced war story with plenty of violence and action, coupled with a romance subplot and, of course, those ker-azy Egyptian gods getting up to all sorts of divinely demented antics. My models for the book have been Alan Furst, masterly penner of World War II spy novels, and to a lesser extent Ian Fleming and Neil Gaiman, but its thematic preoccupations remain my own, namely factions in conflict with one another and the remoteness and lack of accountability of our rulers, be they temporal ones or deities. There’s also some stuff about the often fractious relationship between brothers, which I have no first-hand experience of but which I have extrapolated from my sons (on a purely theoretical basis, as I sincerely hope they don’t, in adulthood, turn out like the two brothers at the centre of the novel). Preliminary feedback on Ra from Solaris has been encouragingly positive, and the cover rough they’ve sent me has got me very excited. I’ve made a couple of short story sales lately. One is to Extraordinary Engines, a steampunk anthology from Solaris, out this October and edited by the estimable Nick Gevers (I can never work out whether “estimable” is better or worse than “inestimable”, but Nick is certainly one or the other, if not both). The tale is called “Steampunch” (see what I did there?) and it’s about giant fighting robots. And why not? The other story I’ve sold is another Chilton Mead tale. “Test Subject” is due to appear in issue #15 of Pete Crowther’s PostScripts, a super-length special dedicated to Paul McAuley. And yet another Chilton Mead story, “Project: Verbivore”, appeared in the 17th January issue of Nature. It’s a neat little squib of a tale which I had an absolute ball writing. The mag’s editor commended it as “one of the corniest, most groan-inducing shaggy-dog stories” he’d ever read, which I took to be high praise indeed. Finally, the “moonlighting” in the title to this item refers to what I consider to be one of the worst-kept secrets ever, namely that I have been publishing a Young Adult fantasy series under a pseudonym. I think now is the time to admit openly that I am the author of the Clouded World series. Jay Amory is I, and I am he/she, and the first two volumes of his/her/my opus are to be reprinted this July in a lovely new big fat omnibus package, entitled The Wingless Boy, with a second omnibus to follow in the autumn, The Clouded World, containing the second two books in the series. I shall now trot out a well-worn joke, with which I have tested the patience of every person at Gollancz at least once: you wait ages for one omnibus to arrive, then two come along together, ha ha ha ha ha. They’re certainly handsome-looking books, with gorgeous covers, and I can vouch for the quality of the contents. Fast-paced, gritty fantasy adventure, with a pair of engaging teenaged heroes, some daft machinery, and oh wait, surely it can’t be … an airship? 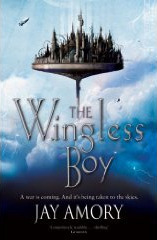 A reviewer in Locus rumbled the secret of Jay Amory’s true identity, as did a couple of cleverclogs e-correspondents of mine, who spotted the similarity between the premise of the series and my short story “Wings”. Basically, a few years back Simon the Gollancz editor suggested that I should have a bash at expanding the world of that story into a multi-volume saga, and a wise suggestion it was too. Foreign rights have been sold in Italy, German, Japan, Taiwan, Romania, Denmark and maybe a couple of other places as well, and sales have been brisk. I had great fun doing the four books and I proudly proclaim authorship of them here.